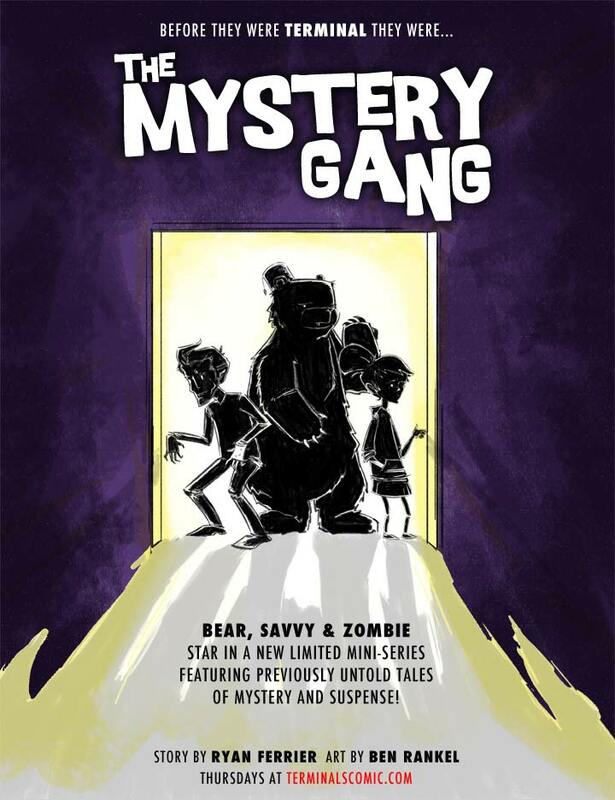 TERMINALS Launches ‘THE MYSTERY GANG’ Spin-off Series! We told you last week we had an announcement, and here she is… with the conclusion of issue #4 coming out this Tuesday, we will begin issue #5 with a parallel running mini-series, The Mystery Gang. This limited series will feature yours and our favorite characters Bear, Zombie and (back from the dead?) Savvy, in a collection of stories taking place before Terminals began. We are beyond proud to have artist Ben Rankel (Three Panel Opera, Wretched Little Creatures) on board to handle the artwork for Mystery Gang. The way it’ll work is simple: just like when we ran our Letters From Eva mini-series, Tuesdays will update with a page from issue #5, Thursdays will update with a page from The Mystery Gang. We’re all really excited to bring more stories, more depth and more substance to the Terminals universe, and The Mystery Gang will do just that. We hope you dig it! The fun begins Thursday. Don’t forget Tuesday’s finale for issue #4 either… it’s a big one. Savvy’s back! Hoorah! Super excited. Well, at least Bear will be there; hopefully not being tortured. That will be nice. @wwlaos – Yowch. We’ll do our best to keep the suffering to a minimum. Generally speaking I try to amplify suffering as much as possible. I’m going to use colours that will make people’s eyes bleed.